If you work with ANT+ products, then you work with ANT+ Device Profiles on some level. By definition, every ANT+ product implements at least one ANT+ Device Profile; making it interoperable with other ANT+ products that implement the same ANT+ Device Profile. As a consumer, an awareness of ANT+ Device Profiles helps you choose compatible products, and an understanding of the development process helps you estimate how long it will be before compatible devices start appearing on the shelves. This helps you choose whether to buy any early proprietary options, go with another standard, or wait for the ANT+ products to arrive. As a developer or product designer, knowing which new ANT+ Device Profiles are in development and what stage they are at will help you choose whether to develop your own proprietary solution, or wait for / work with ANT+ to design the communication standard for you. ANT+ Device Profiles are developed in conjunction with industry leaders and cover the key use cases and features required to lead the market. Once new ANT+ Device Profiles and products are released, consumers can buy them: safe in the knowledge that the device will interoperate with any newer devices built to the new ANT+ Device Profile, and (if applicable) be compatible with products that were built to older versions of the same profile. New features can often be enabled on older devices by downloading firmware updates provided by the manufacturer. ANT+ Members have the ability to influence new ANT+ Device Profile development, and to access documents much earlier than ANT+ Adopters. 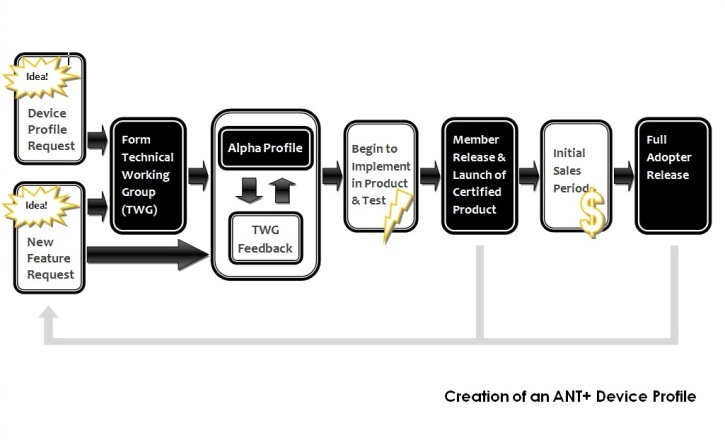 This enables ANT+ Members to lead the ANT+ market, and be the quickest to provide innovative new products to their customers. Idea exploration Preliminary version for feedback and review. Solid, backwards compatible version accessible only to ANT+ Members. The same as member early release but accessible to all ANT+ Adopters. Discuss: business case, use case and feasibility Fully define use case options and minimum requirements for interoperability. Define topology and data transfer. Check for backward and forward compatibility. Products can be certified, and profile is added to SimulANT+. Summary in thisisant developer section. Profile accessible to ANT+ Adopters. Plugin support may be scheduled.